You may remember from my earlier post about this room (or you may have forgotten because after all it was quite some time ago!) I was never happy with the bed I originally had in here. I realised this room was crying out for an iron bed. So I played with some wire and beads and exercised some great patience to make a new, old looking bed. 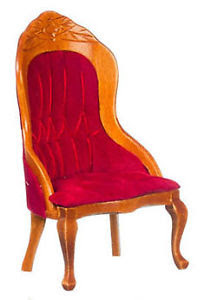 A red velvet chair like this was in a big bag of dollhouse furniture I was lucky enough to find at an op shop! The chair was transformed with a little paint and fabric. Finding something tiny enough to use as upholstery nails was a challenge...but you know I enjoy a challenge! It was my good fortune to find the cutest box of vintage 'Lilliputian' pins at an op shop. The bed cover is an exquisite vintage handkerchief. I've purposely made the bed look a little lumpy and lived in...it's supposed to be an old bed after all. Luckily the handkerchief was the perfect size for the bed. I don't like it when I have to cut vintage handkerchiefs up! There's some old paper above the bed. It looks wonderful! I like your delightfully shabby chic chair as well. Absolutely love the bed and chair...well- the whole room. Thank you for posting! Great job on everything! I have a ton of the Victorian red velvet furniture and have been looking for some ideas to update. Your chair transformation is really good. Great photos too! Great bed and the handkerchief is perfect on it. Gorgeous room! La cama queda preciosa. Has hecho un estupendo trabajo con ella.La silla ha cambiado totalmente con el nuevo tapizado. I had to go back and take a look at your old bed vs the new and I have to say that your new iron bed is BEST! I love the airiness of the frame and the vintage linen spread which is a PERFECT fit! I also love the wallpaper panels above it which makes waking up in the morning much more pleasurable. Your raggedy old chair may have seen better days, but is loved nonetheless and makes a wonderful companion with the rest of the elements within the space- Beautiful Work Mercedes! Hi Mercedes - I am a bit of a newbie to this, so never saw your old bed, but I LOVE your new old bed. The room a so beautiful and I wish I was the mini person waking up in that lovely bed, looking up at the pretty ceiling each day before having my morning cuppa in my trusty, old, comfy chair. Love your bed you have done such a great job, the vintage hankie looks perfect for it, the ones I have all seem too large. The attic bedroom is looking really cosy, love the old chair too! Se ve impresionante ahora esa habitación! la cama es fabulosa y el pañuelo la mejor colcha que podías encontrar para ella! Gran trabajo de envejecimiento en la silla,te ha quedado genial!! What a lovely little bedroom. I love it, and many sweet little things. Hi Mercedes! I love your romantic bedroom! Fantastic bed, looks perfect!!! Hello, Mercedes - The new/old bed is so beautiful; how nice that the vintage handkerchief is such a good fit. I'm always reluctant, too, to cut up something so pretty and delicate. You've transformed the chair into such an interesting and attractive piece - what a difference! I love the air of aged comfort that this room projects, with the romantic ceiling paper and all the lovely items on the shelves. I could happily dream many dreams in this room! Mercedes, It is a perfect bed for the room. Everything looking lovely. What a special handkerchief - so glad to read you did not have to cut it. I am sure you would have had to think twice if it needed cutting. So nice to see you posting again. I love the new bed! It is so pretty. Oh, sigh, it's so beautiful. I love it all but especially love how you transformed the chair!